I have talked to women in at least 15 countries—in their homes, their gardens, their fields, their pastures, their universities, their community organizations, their government and executive offices, and their courtrooms. 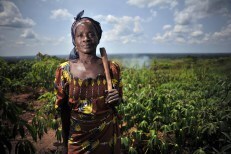 When asked about rural women’s land use or rights or ownership or livelihood, the thing that usually stands out to me is that most women say, in one form or another, that rural women are generally able to use land, and sometimes even control land, when they are in an intact family. But when the family breaks down—because of divorce, death, abuse, or even polygamy—women often are the ones who are forced to leave, taking nothing with them. In much of the rural world, when women marry, they move to their husband’s home and land. And because land is often the most important asset for a rural household, women who lose their right to use land lose much more than just the land. This is what I have heard in 15 countries, which is valuable information, but rather broad and not that useful for policy making or program design. But the just published Prindex report now confirms this information with systematic data from their first wave of data collection in 15 countries (10 from Sub-Saharan Africa, four from Latin America and one— Thailand—from Southeast Asia). Prindex collects robust data on people’s perceptions of their property rights. Only two of the 15 countries where I have worked overlap with the 15 countries in the Prindex report, and Prindex collects data in both rural and urban areas, but this first report provides us with some useful data regarding women and men’s perception of their land tenure security in the event of two major family events—divorce and death. “[T]he differences between women and men’s perceptions are more significant when respondents were asked how worried they were that they might be forced to leave their property in the event of divorce or spousal death: the share of women who were worried was on average 10 percentage points higher than it was among men. As is the case with many of the demographic and economic factors observed using this data, there are some large country-level variations. Under the divorce scenario, Burkina Faso stands out, where 53% of women are worried about being forced to leave their property if they were divorced from their spouse compared to 7% of men, a difference of 46 percentage points. By contrast, Liberia, Rwanda, Costa Rica and Ecuador show very little difference between men and women. Is there a difference between rural and urban women? What is different in Rwanda so that men are more worried about losing their land in the case of death of a spouse? What are the factors that make women feel secure related to divorce and inheritance? Age, individual title, joint title? What differentiates Burkina Faso from the other countries in Africa? In the Latin American countries, more women are worried about the death of their spouse than they are about divorce—are their legal or cultural issues that have an impact on this? It is both exciting and valuable to have ongoing research in three regions of the world that specifically asks women questions about their perception of their land tenure security. “Talk to women” has been a mantra for the Resource Equity staff and other women and land researchers and practitioners all around the world. We are grateful that Prindex is doing just that. Resource Equity’s Research Consortium is looking forward to building on these initial findings with more data and more engagement. For more detail on the report and for diagrams that illustrate the findings on women’s land rights and many other findings, visit: www.prindex.net. This blog was originally posted on the Resource Equity website.